Sicilian Odyssey: Who is Norman Palermo? There is a town near Catania called Misterbianco (sounds like Mister Bianco), and newly arrived Americans often ask, "Who IS this Mister Bianco?" They are mildly surprised to find out there IS NO Mister Bianco, but it is a place (a most confusing place to drive--the Black Hole of Sicily--but with the best shopping around). The same can be said of Norman Palermo. It is not a person, either, but also a place, a most wonderful place/time period to visit. 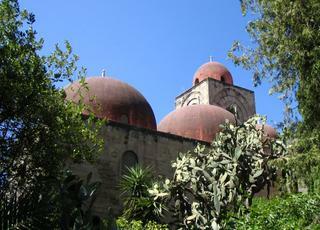 It is ranked #1 in Top Ten Sicily. Even without knowing a lot of history (like me), you can appreciate Norman Palermo for its charm, diversity, beauty, and age, though in Sicilian terms, one thousand years is not old! So, to put it in simple terms for the non-historians among us, way back in 1061, Count Roger de Hautville, a Norman (from Normandy, aka France), took advantage of an internal Arab conflict (sound familiar? ), invaded Sicily with his band of crusaders and took over the place. He then proclaimed himself King Roger of Sicily, the first of five Norman kings to rule Sicily over the next century. Heck, I didn'teven know they had the name Roger back then! Anyway, withouut any kingly experience, Roger did a bang-up job and Sicily, especially Palermo, benefited hugely in terms of culture, architecture, government, tolerance, harmony, and wealth. This is another example of of "It's good to be the king, especially a good king!" Arab and Western influences blended smoothly and the enlightened attitudes in the arts and other areas actually led to the beginning of the Italian Renaissance. End of history lesson. 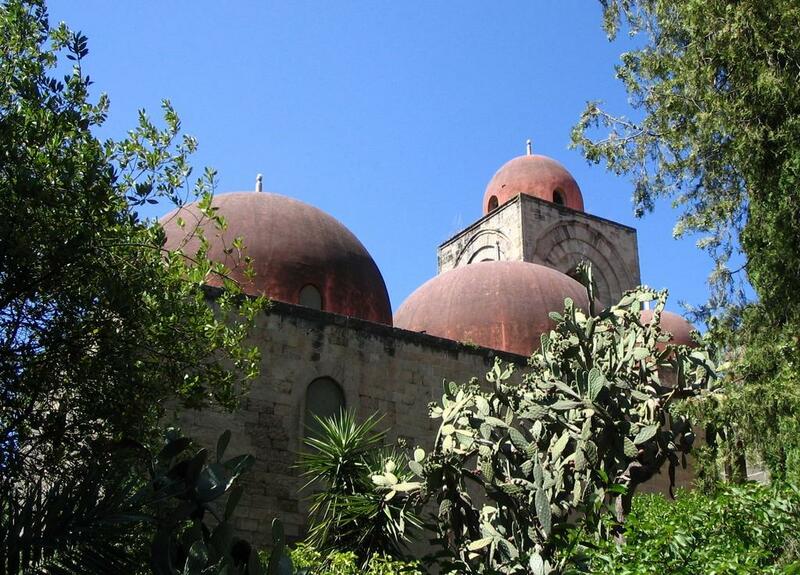 So, if you go and look for Norman Palermo, you'll find wonderful and wonderous architecture that mixes Arab, Byzantine, French, Roman, Greek, and a few other civilizations. The best examples are the cathedral exterior, the Capella Palatina (chapel) of the Palazzo Normanni (Norman Palace) with its fabulous Christian mosaics done by Arab workmen, San Giovanni degli Eremiti (St. John of the Hermits) church and cloister, and La Matorana and San Cataldo side-by-side churchs with the red domes. All of these are within walking distance, by the way, although parking is a major challenge. There are more, of course, but these are the ones I saw and fell for. South a little from Palermo you'll find the crowning Norman achievement--the Cathedral of Monreale, considered one of the most spectacular and beautiful churches in the world. I wrote a previous entry about Monreale called "Mosaics and More in Monreale" in March 2005. So, you see, Norman and Roger and William and all those guys really added a lot to Sicily and especially to Palermo, which might be quite bleak without these additions. It certainly counteracts the dried up corpses of the Capuchins. Stay tuned for that story. I never thought of "Norman Palermo" but we laughed every time we drove by the sign for "Misterbianco." 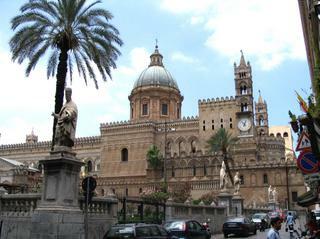 Palermo is fabulous, and the cathedral in Monreale is incredible. Sadly, we missed seeing the cloisters there. I'm looking forward to a return visit.